Adobe on Monday announced the latest version of Photoshop Elements 9, the company's consumer-level photo editing application, for both Mac and Windows. There are a number of features in this version that are new to Mac users, most notably the bundled Elements Organizer, which acts as a hub for importing, managing, and viewing photo and video files. In an exciting addition for all platforms, Photoshop Elements 9 takes the power of one of Photoshop CS5's most popular features, Content Aware Fill, and puts it into the Spot Healing Brush. This powerful new tool can be used to remove specific objects from an image by analyzing the surrounding information. Also new to this version are Layer Masks, which can be used to block out specific parts of images with varying transparency levels. Users new to photo editing can use the program's guided edits to learn how to make basic or fun edits to their images, including imitating the toy camera look, with easy to follow step-by-step instructions. Photographers can then share their creations by posting them directly to sites like Facebook and Flickr from the organizer, or by using any of the templates included in Elements 9 to create scrapbooks, photobooks, online albums, or slideshows. The Elements Organizer lets users sort images in a number of ways, including with automatic face recognition and keyword tags. A new auto-analyzing tag feature analyzes the content of images, such as lighting and contrast, to smartly suggest appropriate keyword tags. 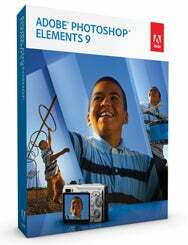 Photoshop Elements 9 runs on Intel Macs running 10.5.8 or later. The program will cost $100 and come packaged with the Elements Organizer. For an additional $50 users can upgrade to Photoshop Elements 9 Plus, which adds 20GB of online storage and access to various libraries of templates, guides, and artwork.